A disastrous finish saw Kettering Town drop more vital points as their hopes of a title challenge in the Evo-Stik South League Premier suffered a dramatic blow after a 1-1 draw with lowly Kings Langley at Latimer Park. While never being at their best, the Poppies looked to be heading for another home success and to the top of the table on a day when others around the dropped points. They led after an early goal from top scorer Aaron O’Connor and, despite numerous good chances coming their way, were unable to find the second goal that would have killed the game off. But Kings Langley defied their league position. While Paul White was rarely troubled in the Kettering goal, the visitors did their best to give as good as they got when they had the opportunity. 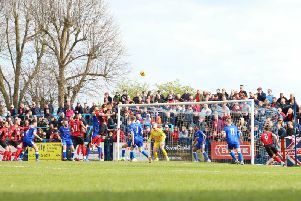 And, in the first of just two minutes of stoppage-time, a lapse of concentration cost the Poppies a vital win as Rene Howe flicked a corner into his own net. It as a hammer blow, especially with hardly any time remaining for them to find a response. Frustrating. That would be the appropriate word. And, unfortunately, frustrations boiled over as boss Marcus Law exchanged words with Poppies supporters as he headed down the tunnel. Clearly, Kettering are having a blip and that’s not something they’ve been used to this season. Since seemingly confirming themselves as title contenders when they beat King’s Lynn Town on New Year’s Day, they’ve now taken just one point from two matches against teams in the bottom half of the table. That’s not going to win you a title, especially when there is so little room for error when a juggernaut in the form of Hereford is waiting to pounce. There was certainly nothing wrong with the first 25 minutes in this one though. Kettering took the lead when Ben Toseland’s pinpoint cross was headed down by Howe and O’Connor smashed his shot into the roof of the net. The top scorer was out of luck on 19 minutes when he was played in by Lindon Meikle and, despite beating goalkeeper Martin Bennett, he was denied by a heroic goal-line clearance by Jorell Johnson. Bennett did earn his own plaudits soon after, however, when he stood strong to block another O’Connor effort after the frontman had latched on to a Howe flick-on. But, with that second goal not coming, the visitors grew into things as the Poppies became slightly more laboured. And the warning signs were there when Callum Adebiyi’s header from a Matthew Ball corner was stopped by White before being cleared. There was little to write home about in the first 25 minutes of a scrappy second half with neither side really troubling the other. But a golden chance to wrap things up arrived with 14 minutes to go when substitute Brett Solkhon threaded a lovely ball through to Howe who saw his shot cannon off the inside of the post with the ball landing in the grateful hands of Bennett. The frustration only grew when debutant Orrin Pendley, who was generally solid alongside Tom Marshall at the heart of the defence, thought he had doubled the lead with an excellent finish. Unfortunately, the flag had long been up for an earlier offside. The chances came and went. But Kettering couldn’t see it out as the visitors pinched a point in the dying seconds. One corner and a long throw had already been defended. But when another corner came in, Howe rose to clear but the ball skimmed off the top of his head and nestled in the bottom corner of the net. A devastating and, it has to be said, slightly unfortunate blow, which could yet have long-reaching consequences - certainly as far as the title is concerned. The Poppies are having a bit of a spell, which they need to get themselves out of before it becomes something more damaging. Poppies: White; Bateman, Pendley, Marshall, Toseland; Stevens (sub Hoenes, 84 mins), Mulligan, Milnes (sub Solkhon, 70 mins), Meikle; Howe, O’Connor. Subs not used: Akindi, Thomas. Kings Langley: Bennett; Folarin, Connolly, Johnson, Adebiyi; Godfrey, Coldicott-Steven; Weiss, Ball (sub Jung, 86 mins), Ward; King. Subs not used: Collins, Tring, Gosling. Goals: O’Connor (7 mins, 1-0), Howe og (90 mins, 1-1). Bookings: Pendley, Mulligan, Folarin (all fouls).